Retired Educator (Chemistry and Physics Teacher, Assistant Principal and Assistant Superintendent at La Junta Public Schools). Presently part-time Administrator at Casa Del Sol Retirement Community. Serves on the Board of Directors of the Bent’s Fort Water Company. Served on the Board of Directors and as President of the Colorado Rural Electric Accountants’ Association and on the Rural Electric Credit Union Board. Currently President of the Swink Lions Club and SE Colorado Antique Vehicle Club and past president of both. Active member of Holy Cross/St. Andrews Lutheran Episcopal Church. Married, two children and four grandchildren. Retired bookkeeper/accountant. BS degree in Business from University of Kansas, four children, and eight grandchildren. Volunteers treasurer for many local and regional organizations such as City Recreation Commission, Rocky Mountain Food Processors, and Picketwire Players. Retired Educator (20 years as Technology Director for La Junta Public Schools, High School Business Education teacher prior to that.) Trained faculty and students to use various software over the years. Volunteers for the Community Concert Association and Hospital Auxiliary. Webmaster for Otero Museum, Arkansas Valley Community Concert Association and Phi Chapter of The Delta Kappa Gamma Society International. Has rejuvenated the cataloging process at the Otero Museum. Retired Santa Fe Railroad Officer, Associates Degree, Brown’s Business College. Married, one son, four daughters. Past President La Junta Lions Club, Past Master Masonic Lodge #64, La Junta Chamber of Commerce Community Service Award Winner 1991, and the Colorado Centennial Volunteer Award for the State of Colorado, 2001. World War II veteran, U.S. Navy SeaBees. La Junta native, La Junta High School graduate, Otero Junior College graduate, three children. Retired stenographer/clerk for the Santa Fe Railroad. Member of the Christian Church, currently serving on the Board of Directors of La Junta Associated Charities. Her family, the Millers arrived in La Junta by covered wagon. Spends countless hours at Otero Museum cleaning items, organizing tours and tour guides and cooking for fundraisers. Married, two sons and one daughter. Retired teacher from Child Development Services, Otero Junior College. 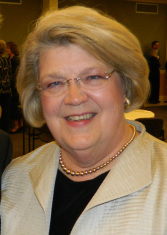 Member of Woodruff Memorial Library Board. Granddaughter of early business family in the area. President and shareholder of Falcon Industries, Inc. Graduate of La Junta High School, Otero Jr. College and Colorado State University. La Junta grown and vine ripened, with family roots in the area dating back to 1875. Rancher, Otero County Commissioner District II, La Junta High School graduate, Associates Degree, Otero Junior College, Bachelor of Science, Business Mgt, University of Southern Colorado. Married, 2 children. Boards include Otero County Landfill, 4-H Foundation Director, Timpas Grazing Director, La Junta Chamber of Commerce. Retired Customer Service Supervisor. A La Junta native with great interest in the preservation of our local history including Otero County and Southeastern Colorado. Three children along with their families all live in the La Junta area. As a great-granddaughter of Kit Carson, my interest in history was established at an early age. In addition, my family ties include a strong connection to the local railroad industry. Thank you Ernie Orahood, Katie Schroll, Ron Davis, Kevin Karney and Marilyn Mast for your years of service to the board and to the Otero Museum.